Just the right size for the younger crowd! 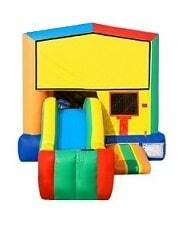 This mini slide jumper is just the right size for children ages 2-10 and features an 13'x13' bounce area with a 7' slide and basketball hoop! Capacity:: 1-8 participants, up to 150lbs. Max 1000lbs. Minimum space: 23'L x 15'W x 16'H. Doorway/Pathway: At least 3ft wide. Electrical outlet(s): 1 - Generators are required for Park/Fields. Supervising Adult: 1 - Company attendant(s) can be added for additional fee. Surface: Cannot be set up on dirt, rocks, sand, bark or within 10ft of pools. Please note: Event dates may get booked out, despite item availability. Copyright 2019 San Diego Bouncers All rights reserved.